This entry was posted in Garden and tagged Blindingly obvious Flanders and Swann quotes, Christmas, Mad? Me?, Spiders. Bookmark the permalink. I will remind you that you do find baby spiders ‘cute’ but of course they grow up – & multiply! I have some weblike blobs under the eaves which I am sure contain offspring Arachnida, but I daren’t disturb them in case their parents see me & decide to wreak revenge. I can see them because my house is upside down & the roof is low over the windows. However they may also fall onto the porch & get me as I leave the house so I will leave them to the birds. As to your house plants you seem to have the same colour fingers as Becky – not green in the houseplant department! 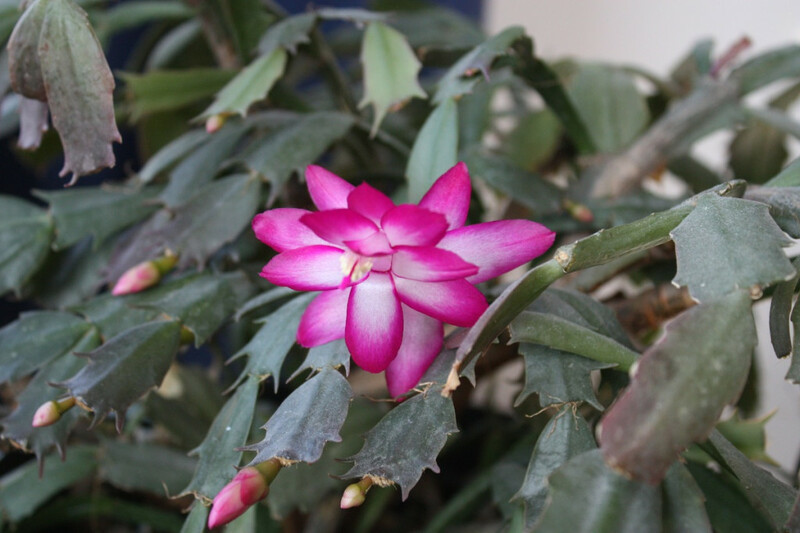 The Christmas cactus is a common misconception as I had one that flowered at Easter so perhaps it is a religious plant that decides which of the events in Jesus’ life it wishes to remember by flowering. Maybe yours should be named accordingly – may I suggest Magdalena? It’s bound to be female as it comes back after being starved or neglected.